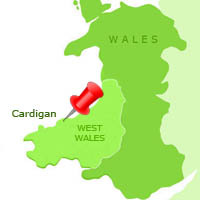 The pretty town of Cardigan retains elements of a fascinating history. Situated on the banks of the beautiful Teifi Estuary, it was one of the great ports and shipbuilding centres in Wales during Elizabethan times. As the river began to silt up and with the coming of the railways in the late 19th century, industry suffered a sharp decline. Today the quays and buildings are in the process of renovation and already provide a performance area and a boat trip pontoon that facilitates extensive fishing, kayaking, sailing, and commercial boat trips. Overlooking the river is the 12th century castle and site of the first Eisteddfod. Work commenced in 2013 to restore the castle walls as well as the grounds and Regency house set within them. Removal of the steel buttresses which used to support the walls and painstaking repair of the stonework has made a huge difference to the visual impact of the castle when viewed from the old bridge. A finalist in the TV programme ‘Restoration’, it is an exciting and ambitious project, now due for completion in 2015. Cardigan’s Guildhall and Market Hall were built between 1856 and 1859 and are now home to an indoor market, regular craft sales and art exhibitions. Outside the building is a Russian cannon which was given to the town in 1857 in memory of Cardigan soldiers' sacrifices in the Crimean War. The gun was used in the Battle of the Light Brigade, during the famous charge at Balaclava. The town has galleries and craft shops along with a cinema and two theatres. Arts enthusiasts will also enjoy the programme of events and concerts at RhosyGilwen, an internationally famous venue near Cilgerran. A multitude of cafés and coffee shops offer a variety of fayre and you can stock up on supplies at the fortnightly summer farmers’ market (2nd Thursday in the month May to September) and Country Market. Around the town there is a nature paradise including grey seals and sea birds at Cardigan Island. Walking the Teifi River Trail (incorporating the Teifi Marshes nature reserve) is a superb opportunity for discovering rare plants and birds and has deservedly been designated a Special Area of Conservation. 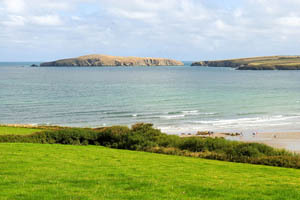 See more things to do in Cardigan Bay and things to do in North Pembrokeshire. Looking for somewhere to stay in Cardigan? 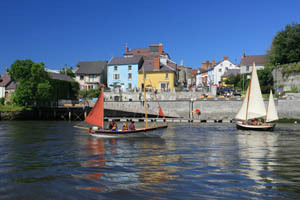 See holiday cottages in Cardigan.